This weekend, Simon is coming! And so are a lot of my other DOC friends! Some I've met before, others I haven't. And I am SO EXCITED! If you see #Simonpalooza or #imwiththeband this weekend, it's us crazy peeps. In some part of my brain, I decided it would be a good idea to invite all said DOC peeps to my house while they're here. Oy. Which means all my spare time is being spent cleaning and reorganizing like a madwoman! I even missed Castle last night! I NEVER miss Castle. This is how much I love you all, my #Simonpalooza peeps. So this will likely be the only blog post I manage to crank out this week. And I'm publishing thru email, so forgive me if this post looks weird. Lee Ann has come up with a fantastic idea for World Diabetes Day! I can't wait to participate! The World Diabetes Day Postcard Exchange! Give Lee Ann your address, and she'll give you an address to which you send a postcard. In return, you'll get a postcard from someone else. Awesome, right? Go like the facebook page while you're at it! This Friday, October 7th, is No D Day. George posted all about it on his blog. I'll likely be too busy to participate, but I think it's a great idea! Basically, it's a day for the DOC to share others parts of our lives apart from diabetes on social media. Blog, facebook, and tweet all you want, but don't talk about diabetes! On Twitter today, I saw some friends linking to Diabetes Heros: Torchbearers. It is awesome! Take a look, and you'll definitely see some familiar faces! I LOVE this! Also, while you're watching the videos, give some facebook likes to your faves. Or to all of them. The Torchbearer with the most likes by World Diabetes Day gets $10,000 for their local JDRF chapter, so like away! And finally, I am honored that my post Five Words was named the best motivational post for September by the Best 'Betes Blogs. Although I think most of the credit goes to George for inspiration! Be sure to check out all the other winning and nominated posts. It's quite the list! I'm so happy about a No-D day. One thing I've learned in blogging is that I just can't talk about it in every post. 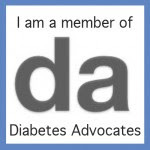 My life is so much more than diabetes. It's part of why I don't blog as much anymore! I just can't make every post about diabetes but I'm positive my life as a (non-crafting, un-funny) mom of 2 isn't all that interesting...so I've cut back on blogging. I can definitely fit in some Non-D blogging this Friday. Yay. I'm so jealous for the awesomely awesome-tastic time y'all are going to have this weekend! And congrats on your Best 'Betes Blogs honor... very impressive!